In the name of getting big quick, it seems like some of the most valuable private tech companies are turning to mergers and acquisitions (M&A) as a way to accelerate business growth. So-called “unicorns”—privately-held technology companies which achieve billion-dollar valuations sometime before (or as a direct result of) going public or exiting via M&A—are chomping at the bit to make their first acquisitions, suggesting a mounting pressure on companies to grow even quicker. 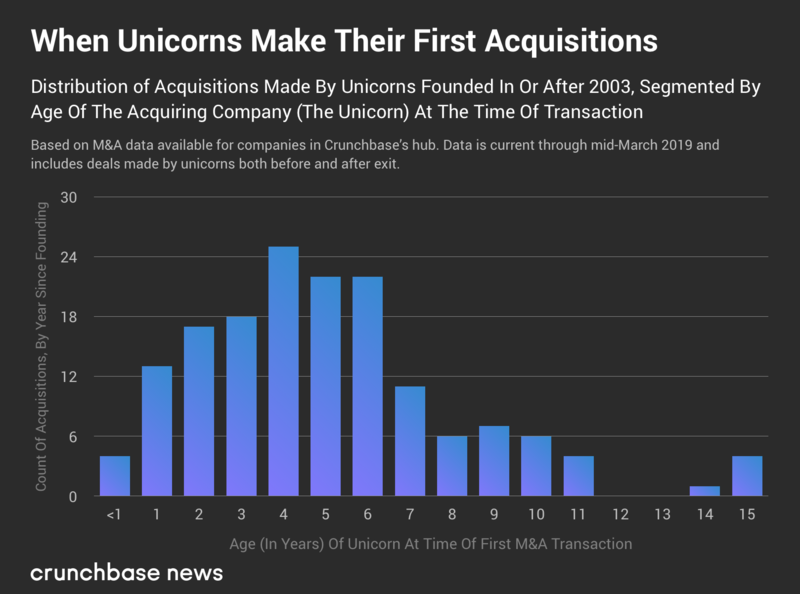 Analysis of Crunchbase data indicates that, on average, recently founded unicorn companies are more likely to make their first M&A transactions sooner after founding than their older counterparts. In other words, younger unicorns buy other companies earlier. Here’s the data. Using M&A data for companies in Crunchbase’s unicorn list, we found out when unicorn companies made their first M&A transactions on average. (We detail a bit more of the methodology in a note at the end.) Companies founded in more recent years were quickest to hit the M&A trail. Eleven unicorn companies founded in 2007 took an average of roughly 8.33 years before making their first acquisitions. At time of writing, 29 unicorns founded in 2012 have made their first startup purchases, averaging just 4.1 years before doing so. Note that there’s a bit of a sampling bias here. 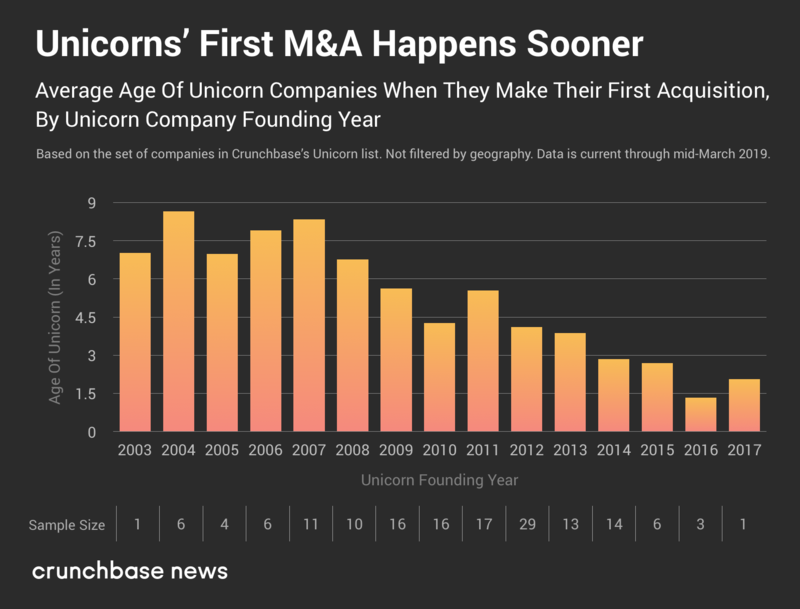 To an extent, it’s expected that unicorn companies founded in more recent years will have a lower average age of first acquisition, because there are many unicorn companies which haven’t yet made their first M&A deals. The bulk of all M&A transactions by unicorns (not just the first ones) occur within the first seven years after founding. We should take recent years’ dramatic reduction in average time until first acquisition with a heftier grain of salt (again, there are plenty of unicorns which haven’t yet gone shopping for startups). Even with that caveat made, averages have steadily trended lower between 2007 and 2012, after remaining steady (across an admittedly small sample set) since the start of the unicorn era. This suggests that younger unicorns are increasingly using M&A transactions as a way to accelerate their path to massive market power. It’s a big move for a company to buy another one. There’s all the financial particulars to negotiate, the legal and regulatory hurdles to clear, and the inevitable friction of integrating teams and technology from one entity with another. And that’s when the process is amicable and goes smoothly. The amount of time and resources a company commits to carrying out an M&A strategy is nontrivial, so it’s understandable why a company would put this process off to a later date or eschew it entirely. That high-growth tech companies are pursuing such a time and energy-intense strategy earlier on in the venture life-cycle points to the benefits M&A can bring to startups seeking to scale speedily. We found this by analyzing the set of acquisitions made by companies in Crunchbase’s list of unicorns, which we used as a proxy for “high-performing private technology companies” as a collective whole. We found the time elapsed between unicorns’ listed founding dates (which, note, have varying levels of precision) and the date of their first-ever acquisitions, regardless of whether the acquirer had achieved unicorn status. We then plotted the resulting data in a couple of ways. More information about Crunchbase News’s methodology can be found on a dedicated page on this site.